Now that we are in the height of winter, many people are getting outside to enjoy winter sports such as skiing, snowboarding, and snowshoeing. There are many ski resorts throughout northern Michigan, so keep reading to find out where you can ski or snowboard locally! Mt. 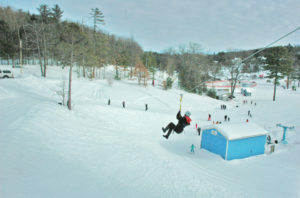 Holiday is located on the east side of Traverse City and offers skiing, snowboarding and tubing in the winter months, with a year round event venue and zip lining in the summer months. For this season, ages 0-4 and 65+ ski free! Hickory Hills is owned and operated by the City of Traverse City. They offer 8 ski runs that are serviced by 5 rope tows, and 4k of trails for cross country skiers. Skiing at Hickory Hills is definitely a bargain, with adult season passes costing only $140 for city residents and $180 for non-city residents. 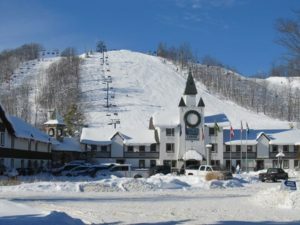 Crystal Mountain and Shanty Creek Resorts are both a short drive from Traverse City and offer skiing, snowboarding, cross country trails, and many other winter activities that are fun for the whole family. While Timberlee Hills no longer operates as a ski hill, they still offer snow tubing in the winter. It’s all the fun of sledding, but with a rope tow to bring you back up the hill! If you fall in love with Traverse City while enjoying the area’s winter sports, you might want to consider a home or second home in the area. Click here to search for properties for sale in the Traverse City and surrounding areas.